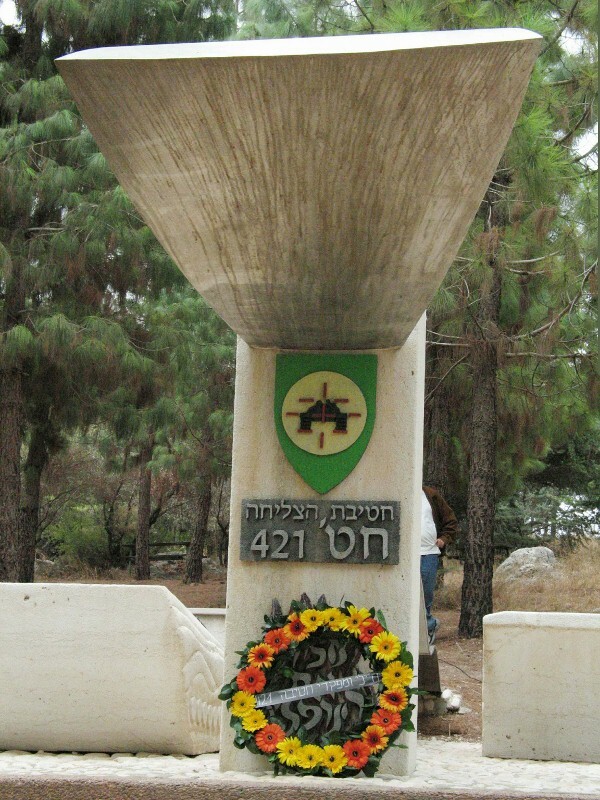 Welcome to the memorial for the 421st Brigade, a reserve armored unit of M48 Patton tanks that was part of Ariel Sharon's armored division in the Yom Kippur war. This Brigade was the first armored force to cross the Suez Canal . On the morning of Yom Kippur, October 6 th 1973 , the Egyptian and Syrian armies launched a surprise attack against the State of Israel. The 421st Brigade was a new reserve unit that had just been formed the year before. When the war broke out, the brigade was not fully organized for combat, and most of its units did not even have a permanent base or equipment. On the first day of the war, the commanders and soldiers of the brigade had to gather equipment from bases all over the southern command. This included tanks, armored personnel carriers, army vehicles, weapons, ammunition, radios and more. At dawn, October 7 th , the units of the brigade organized and started moving on tank tracks towards the Sinai. At the end of that same day, the second day of the war, the first tanks, commanded by brigade commander Colonel Chaim Erez, reached the central section of the Suez Canal front. The commanders of the battalions were Major Giora Lev, Major Ami Morag, and Lieutenant Colonel Shimon Ben Shushan. The path of war of the brigade was fought in 2 phases, described on the 2 map plates on the stone structures in front of you : In the first phase, described on the map on the right, the brigade took part in the Israeli effort to contain and block the advance of the Egyptian forces. The second phase, described on the map on the left, was the crossing of the Suez Canal and the counterattack into Egyptian territory. The brigade held the Tassa-Isma'ilia road section for a week, and waged several difficult battles on a long sandy dune blocking that road, code named Chamutal. The brigade lost 19 of its soldiers in these battles. The unit gained combat experience during these battles that ultimately ended in a tank-to-tank battle against the Egyptian 21 st division on October 14 th . The tanks of the brigade destroyed dozens of Egyptian tanks, loosing only one tank. Following this battle, the brigade was pulled out from the Chamutal area, and received orders to start preparations for crossing the Suez Canal . The brigade was assigned to deliver the engineering equipment needed to cross the Canal, including amphibious rafts, pontoons, and a large 600 foot long roller bridge. The crossing of the canal was planned to take place near the point where the Suez Canal flows into the Great Bitter Lake - see the map on the left. On the night of October 15 th , most of the tanks were occupied in towing and defending the crossing equipment. The rest of the brigade took part in a battle to occupy the Chinese Ranch, an Egyptian Army stronghold that controlled the access roads to the crossing point and threatened the entire operation. At sunrise on October 16th the first tank of the brigade crossed the Suez Canal on an amphibious raft. It was the first armored crossing of the Suez Canal and it turned out to be the turning point of the war on the southern front. The IDF shifted from a defensive position to offensive initiative on Egyptian land. The first tank to cross the Suez Canal , making military history, is on exhibit in the nearby museum to the west of the main building. Here is the authentic radio conversation with division commander General Ariel Sharon, in which brigade commander Erez reports that he is actually sailing on the Suez Canal . Real time (1973) radio recording After crossing the Canal, the brigade organized as an armored reconnaissance group. The mission was to destroy anti-aircraft missile bases, and thereby enable the Israeli air force to operate freely on both sides of the Suez Canal . In one day, the force traveled some 100 kilometers deep inside the Egyptian territory, destroying in its' wake anti-aircraft missile bases, tanks, vehicles and equipment of the Egyptian army. The Egyptians were overwhelmed by the onslaught. Here is a live report of the brigade commander to division commander Sharon, in which Erez is simultaneously reporting, operating his tank and giving orders to his personal tank crew. By the time a cease-fire was declared on October 24 th , the brigade controlled 250 square kilometers of Egyptian territory west of the Suez Canal . The cease-fire found the brigade holding the Northwest corner of the enclave occupied by the IDF in mainland Egypt , on the Cairo-Isma'ilia road, 15 kilometers southwest of Isma'ilia. 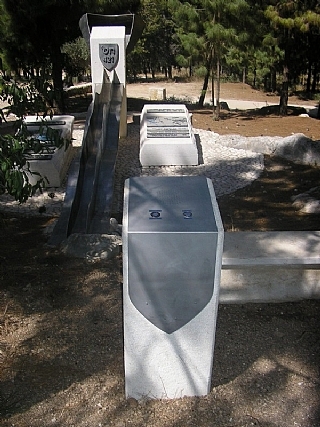 The memorial in front of you was designed and built by sculptor Gershon Heiman. The sculpture represents the sequence of battles fought by the brigade, beginning with the containment of the Egyptian offensive, to the crossing of the Suez Canal and the breakthrough into the vast desert region west of the Canal. The central column depicts the blocking of the Egyptians, from it protrudes a steel figure reminiscent of the hull of a M48 Patton tank - the brigade's main weapon. In front of the column – is a memorial flame dedicated to the memory of the 48 soldiers of the brigade who fell in battle. On both sides of the central column, the two stone structures represent the amphibious vehicles that carried the tanks across the Suez Canal . On top of these are the maps describing the brigade’s battles. The design on the sides of these stone sculptures symbolizes the roller bridge being towed in the sand dunes of the Sinai desert. Between these pieces is a wavy, stainless steel element symbolizing the Suez Canal . The brigade's veterans use this memorial on memorial days and as a meeting place. During the months of late winter and spring the bloom of cyclamens around the memorial adds another special attraction to the visit. The veterans of Brigade 421, known as ”the Suez Canal crossing brigade”, thank you for visiting this memorial and for the interest you showed in the brigade's legacy.